Anti-iPad? We've got the top slates for you! Looking for a tablet and thinking about an Android device? 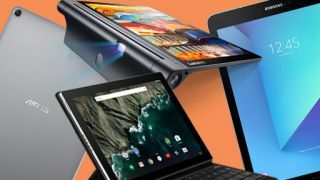 Well, there are other options out there with Windows 10, such as the Surface Pro 4 - but tablets running Android remain the main rival to the iOS-toting iPad, iPad Pro, iPad Pro 9.7 and iPad mini 4. There are plenty of reasons to invest in the Samsung Galaxy Tab S2 - especially if you're after one of the best Android tablets on the market but at a cheaper price than the Galaxy Tab S3 above. It's reading and web surfing-friendly, while the new 4:3 screen and general size and shape works for casual tasks. Videos work better on the Tab S3 as compared to its the Tab S2 thanks to its elongated aspect ratio - but they don't exactly look bad here.